DC's February 2018 solicitations are out, and the rebirth of DC continues to stamp its authority across the comics landscape, with more new ideas, characters and twists. Here are 5 of the best footprints left in its wake. ONE) I haven't felt the buzz of the Earth 2 novels so far, but Green Lantern: Earth One looks to change that in 144 high-concept pages. Bored with prospecting asteroids, astronaut Hal Jordan discovers a ring that re-lays cosmic adventure at his feet. First challenge: revive the Green Lantern Corps, a police force once wiped-out by the Manhunters and now lost to the stars. Yeah, see? This will definitely be what my heart desires this coming Valentine's Day. 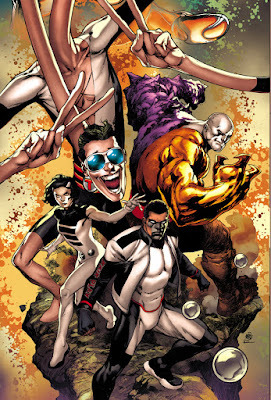 2) The JSA, Outsiders, All-Star Squadron and the Legion of Super-Heroes might all be missing from the DC line at the moment, however, chucking a representative of each into a new title with a killer creative team backs up the name in The Terrifics #1. 'The Challengers of the Unknown' feeling is fantastic, and the line-up is one of the most interesting in comics. Even before news of Tom Strong's involvement, this was a sure-fire lock for my pull-list. 3) I haven't even read the first issue of this event series, and I'm already hyped for Doomsday Clock #4. Rorschach in the DC Universe - #longoverdue. 4. I love the idea that General Zod has his own planet, and the concept is looming large (in a non-crossover way) in the pages of both Hal Jordan and the Green Lantern Corps as well as Action Comics in February, in the lead up to the milestone Action Comics #1,000. Is an inter-planetary war on the cards? 5. DC just needs to give Nightwing to Phil Jimenez for a year or two. It would be #1 with a shot. No offence to the current team, however, it's Phil, and his love for the Titans knows no bounds. In Feb, he gets the art chores for Nightwing #39 all to himself. Watch it fly off the shelves. What're you eyeing up most from DC next Feb? That GL:Earth One does looks pretty good, both in terms of art and the premise. I hope it does well sales-wise like the others. The Terrifics are pretty much taking the place of the FF, so I wonder if this is a bit of trolling on DC's part with that, haha. Looks good regardless, especially with that Ivan Reis on the art. But will he still be on there after the first arc's over? Otherwise I trust Shane Evanier so tell a good story. Wonder where ol' Phil's been lately? Cheers Dale! I like that DC is the troll for once. Too often they are the ones that have shade casted at them, its nice to see the kitty has teeth. Phil's been a bit quiet on his social media too. Prior to Superwoman though he did some amazing stuff for Valiant and IDW - definitely worth a lazy Google image search when time needs filling if you haven't already!